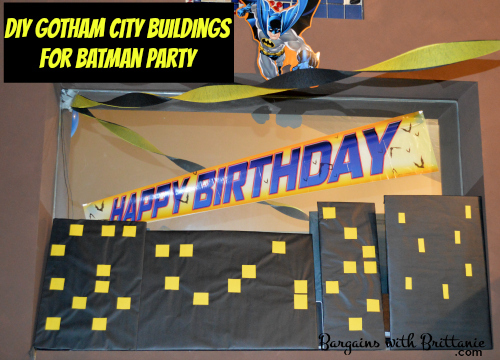 DIY Gotham City Buildings for Batman Party! Last weekend we celebrated my son’s 4th birthday. This year he was all about Batman so in addition to purchasing Batman decorations my husband and I came up with our decoration- DIY Gotham City Buildings! These are very simple to make although they are time consuming depending on how many you choose to make. The instructions for creating these awesome buddings are below. You will soon turn your home into Gotham City in no time! Cut the cardboard to the size you want each building to be. I cut all different sizes but made sure they were all square or rectangle. Cover each piece of cardboard in the black crafting paper. You can secure the paper on by using a thin layer of clear crafting glue or just wrap it around then secure on the back with tape. Cut small pieces of squares and rectangles in the Yellow Cardstock. These will be used as the lights on the buildings. Randomly distribute these onto each building and secure using a thin layer of glue. You can have completed your Gotham City Buildings! Congratulations! These were so fun to make and were a perfect addition to my son’s Batman themed birthday party. These can also be stored away in a box and reused since they are quite durable. Don’t forget to also check out my DIY Batman Party Invitations post here.